The 4R series features Tier 4 engines ranging from 43-66 horsepower and four-wheel drive capability. A power reverser transmission slows the transmission down when the operator uses the forward or reverse control function. 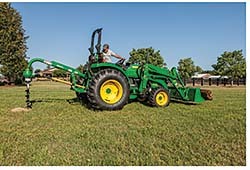 The hitch assist enables operators to control the tractor and hitch while standing behind the machine and eliminates the need to go back and forth from the seat to the hitch. The seat swivels 15 degrees and improves comfort while operating rear implements.